I've noticed that one big 'freak out' point of a student's life is food. Not eating it, being able to afford it. From my experience (although I get a lot of student loan), purchasing my food shop hasn't ever been a struggle for me but I know a lot of my friends do struggle with being able to afford food. It can be for whatever reason: not realising expenditure on other things, shops being more expensive than others, not that much student loan to begin with - this list is endless. Money makes me so anxious, in terms of spending so I'm always cautious when I hand over some coins, notes, or push my card into the machine. So today, I thought I would share with you my budgeting tips for food shopping as a student. Whether you're still rolling in student loan with money coming out of your ears, or watching the moths in your purse/wallet - this guide will be for you! As I'm writing this post, I'm also doing a food shopping. Ah, the irony. Tesco, Sainsbury's, Morrisons, ASDA... Usual go to's, right? Try swapping where you shop. We all know where we stand in shops like that, but I've noticed that swapping where I did my food shopping has actually benefitted me so much. I used to food shop in Tesco (when I was shopping for 1) and a one week food shop costed me about £20-£25. Ouch, right? I wasn't even buying 'finest' stuff either, just your general things, and even value produce. I now shop in Iceland, Aldi and Home Bargains and this has really changed my food game a lot. Sure, they may be cheaper than the 'big' supermarkets, but my food shopping bills for a week now cost me about £10-£15 - big difference! I know that sometimes going to the bigger supermarkets can be more convenient, especially if you have to have a food shop delivered or have to lug it all in a taxi/on a bus, but try your best to change up where you shop. It could be saving you a couple of pounds! Before university, I never shopped in a market. I used to browse them a lot since when I was younger, my nan would take me. It's taken me until I was 19 to actually go and look properly, as well as make some purchases. Some stalls in markets (particularly butchers) may offer a student discount, or may do food bundles just for students. Take my local market for example, for £10, I can get 8 steaks. I know what you're thinking, "Those are going to be crappy cuts of meat", or "There must be something wrong with them". I kid you not, they have actually been the best steaks I've tasted. For that bundle, I got 2x pepper steaks, 2x minted lamb steaks, 2x rib eyes and 2x sirloins. Other deals I've seen have been getting a lot of different types of meat for decent prices, like a chicken bundle for £10, lots of gammon-thick cuts of bacon for £2 or something crazy like that, free items with purchases or every flavour on a chicken breast you can think of. As well as this, if you're not a meat-lover or meat-eater, market vegetables are actually so good for price. For myself and my boyfriend to get: a bunch of carrots, 4 red peppers, a giant head of broccoli and 2 baking potatoes for definitely less than £4. If you bought all that in a supermarket, it might end up being a bit more pricey. P.S: You can also freeze your veggies and meat, but check online for how long! This has been a benefit for me, as I know when I go food shopping and I don't have a 'framework' (if you will) about what to buy, I end up spending so much more than normal. This seems like a bit of common sense, but it does really help. When I've gone food shopping with a list, not only does it make it a cheaper shop for me, but also it saves time. I don't mind food shopping, if I'm honest. It doesn't bother me, I don't love it. I know some people cannot stand going and it actually is a chore, as opposed to being all about your choices and freewill. Also having a list makes me feel way more adult than just randomly picking things off the shelves/out freezers and saying "that'll do". Having a list lets me plan out what food items are for when, as in lunches or dinners. I hate having a list in black penn where I have no idea what time of the day it'll be for. I know as students it's easy to just get food on campus, but buy one meal deal in my uni costs me about £3, which I can actually spend that money on dinners for 2 nights with lunches for a few days (yay for bread being cheap). Writing a list doesn't need to be boring, make it easy to look at and fun! Write things in different colours for different meal times, separate things up into fresh, frozen, household and treats, use really cool paper - anything! I know sometimes lists can make people eyeroll, but it doesn't take much to start jotting ideas down for what you want to eat. I tend to sit down with food websites open (e.g. Iceland and Aldi websites) and go through their deals, as well as what is a good price before hand so I don't end up getting swamped and overwhelmed with confusion and uncertainty of what to buy. Having the website up as a guide really does help me quick plan what to have in the week and if I can't find a 'decent' price, then I'll quickly change it up with a few clicks of my mouse and the gears in my head moving. Personally, I'm a bargain hunter when it comes to shopping (whether it be food related or not), so whenever I see a yellow label or a reduced sticker, I always have a little gander. My favourite place for deals is Iceland, as there's always a deal on something, and luckily for me, it's usually something I like. For example, 2 large chicago town pizzas for £5? YES PUH-LEASE. Cooking wise, I love making things from fresh. I love starting from scratch and making something really yummy (the chef in me is currently having their ego fluffed up, clearly). This also really makes myself proud as a person, as I'm achieving the ways of cooking, as opposed to shoving something in the oven from fresh or frozen - not that there's anything wrong with that at all! I wish I could cook from scratch all the time, but being a student makes that just a bit hard, since fresh ingredients (like chicken breasts as an example) can be more expensive. Sometimes in life, a multibuy can be great. Somethings they're not amazing, but most of the time, they're pretty decent. I tend to multi-buy with lunch items because it just makes it that bit cheaper and you get more for your money (state the obvious why don't you, Chloe?). Again, Iceland are good for their multi-buys, as I usually eat something small for my lunch, like a Birds Eye chicken fillet and putting it in a wrap/in bread, or making eggs (£1.60 for 20 eggs, that's pretty decent - thanks Iceland) on toast. Multi-buys are great for things like that, and I'd recommend looking up some ideas. Check up on websites for any deals, but don't force yourself into buying things on multi-buy. Sometimes things in multi-buys can be great, but other times they might not be as beneficial. Logically think if you really need what's on multi-buy, as you don't want to spend a pointless bit of money on something you may not really need. If you're a pasta/rice lover, buying in bulk is a good idea. For my first year of uni, my mum bought me a 5kg bag of pasta and it lasted me the whole year and I still had loads left over. I find buying in bulk way easier and can save you money in the long run. Things that can be bought in bulk are: pasta, rice, toilet rolls, sponges, kitchen towel and more. As a student, pasta and rice tend to be the most popular foods eaten, and buying larger quantities are not only beneficial for money, but also for the fact you can do so much with them. You can use rice for basically anything you want, chinese dishes, mexican dishes, vegetarian dishes and for pasta, you have have it with different sauces, make pasta bakes, have spaghetti - both products have a lot of use. Pick up that 18 roll bag of toilet paper as opposed to the 4 pack, don't feel worried that someone is going to be watching and judging you for buying so many because in the end, you're the one that's going to be saving money. This one is going to be short and sweet, but I know some people turn up their noses are value products. In all honesty, value products are just as good as ones that aren't. I bought a lot of Tesco value vegetables (peas, sweetcorn, broccoli) and in all honesty, they're just vegetables. I know being cautious is a good thing, but a lot of the time value produce in terms of food aren't even that bad at all. I'm not saying to buy all your food items at the value price, but sometimes value foods aren't that bad, or as bad as you think. Remember, student life isn't all instant noodles, takeaways and value foods! 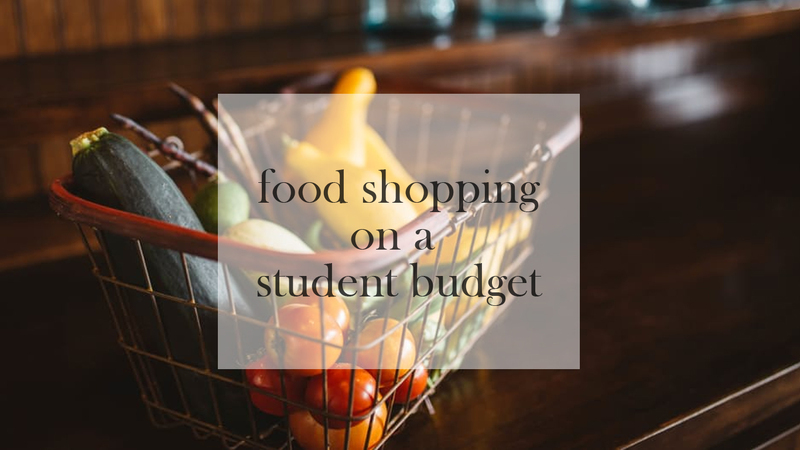 What are your tips for budgeting as a student regarding food shopping? Let me know in the comments and let's have a discussion! Such great ideas, Chloe! I always love reading people's saving tips as you can pick up something new every time! Writing a list is such a good plan, it always prevents me from buying all the biscuits and chocolates I don't ACTUALLY need hehe! Tesco Everyday Value is my best friend haha! Me too, guides really help me adapt some new ideas which I'll probably need! Sometimes even with a list, a sneaky little bar of chocolate or pack of sweets ends up in my trolley! I agree! The market has actually made it so cheap in terms of buying veggies in the supermarkets! These are such great ideas! Writing a list beforehand is so useful as it stops you from forgetting things or buying things you don't need! A lot of people forget the label idea, they are convinced more expensive is better when it normally isn't! This is my type of blog post so I loved it! May I also recommend cashback apps, coupons and wombling too? I don't want to put the posts here but feel free to ask me any questions about those, it's my forte! Yeah exactly! Sometimes not being a 'label snob' is a good idea. I'm glad you enjoyed this post though, sweet! Ooh, that was a good point that I missed, thanks for suggesting it! I was a bit of a label snob, but I've definitely turned that around now! Good luck for university! If you ever want any help, feel free to pop me a message! Excellent tips! This is very helpful for overall budget shopping as well. Whenever I go shopping, if I don't go without a list, I tend to overspend because my thoughts aren't organized. They also have apps that include savings (like digital coupons and cash back) for various items. I'm not sure if they work outside the US, but you could check them out. I'm the same! I need a list especially for shopping so I don't go astray, or forget anything I desperately need! I'll have to give those a go, because we have loyalty cards and things like that over here. I thought so too! Or if you're just genuinely living on a budget! Home Bargains is literally the best, especially if you want to save money on the 'big brands'! There are some great tips here, many of which I've used even when I haven't been a student! One think I don't do is buy rice in bulk, but I should definitely start doing that. The responses on this post have really shown me that it's not just students who do these things, which is awesome! I'm honestly really glad that you doing those things has been helpful! I don't know about you, but when I know I save money, I feel so good about myself! I'm so tight with my money that I budget even though I may not particularly need to! So glad you guys liked it, though. Hi, I am not a student but I think this is an excellent post for those shopping on a budget. I used to always go to Sainsbury's but am now am an Aldi regular. I must save a lot and I find the produce to be good quality. They have a good range of food too. I'm glad you liked the post! I agree, the quality of things in Aldi are actually really decent! These are some great tips for saving money. I'm going to keep these tips in mind for net time I hit the shops. I'm so bad at budgeting so this was a great read for me! I used to be awful for budgeting but I feel like now I'm overly tight with money, haha. I'm glad you like this post, lovely! This is helpful student or not. I should definitely switch to places like Iceland and Aldi to save money instead of ordering in from Tesco and Asda. And I literally can't go shopping without a list or I just buy tons of random things that don't go together! Some lovely tips here Chloe! I agree with them all, lucky enough I didn't move out for University so I didn't have to worry about this! As I pay board to my parents, Farmfoods is another place I shop regularly in as it's soo much cheaper, it's basically like Iceland! Great tips. I wish I had this when I was a student but I think it can be applied to everyone on a budget. Very helpful tips! It was a very good read and I love your writingstyle, keep up the good work buddy!